Although temporarily deserted by his mother, the boy was surrounded by a wide range of play objects that would have appealed to any toddler's imagination. The items of inspiration included child sized wooden animals, some of which had been shaped and painted  complete with mouths, eyes, and ears  by Charles Buckey, the husband of Peggy Buckey. 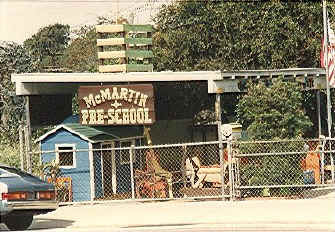 The latter owned the preschool jointly with her mother, Virginia McMartin. 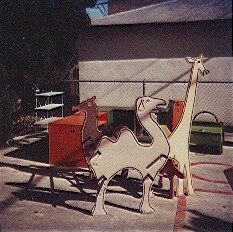 The animals were placed in the play yard, turning it into a child's fantasy menagerie that included a giraffe, several rocking horses, a camel, octopus, dinosaur, and ducks (that children could sit and rock on), and at least one rabbit's face-on profile placed on the wall by the door of the front office. Mixed in with the animals were other objects for children to play on, or play in. A commonplace slide stood next to a makeshift helicopter that children could sit in and pretend to fly. A wooden structure dubbed "Fort - Issimo," resting upon a large wooden platform accessed by two wooden steps, could be driven by one of the two steel steering wheels placed on its opposite ends. A "jungle gym," made of connecting steel pipes, was available for children to swing on. A wooden car allowed children to pretend they were driving (they could even fill up the tank with "gas" from a nearby wooden gas pump). A wooden playhouse with the door removed was available for playing house. These so-called "tunnels" were the only tunnels that ever existed either above or below the premises of the McMartin schoolhouse and schoolyard  or above or beneath any property adjacent to the McMartin property.